Can You Really Make Money With Wrapify.com? This company will pay you to drive around with advertisements on your car! Yes, it may sound like a crazy idea… but is it a real thing? Can you really make money with Wrapify.com? I am all about side hustles! One of my favorite things to do is to explore new ways to earn money on the side. And lately, I have been looking into different ways to earn money with a car. As most of you are probably aware, a car is one of the more expensive purchases that most people make. If you own a car and a home, the car is probably the second most expensive thing you will ever buy. But if you don’t own a home, your car is likely the most expensive thing that you own. But unfortunately, in most cases, cars are actually financial liabilities. They are liabilities because you are paying for the convenience of having them. Other than getting to and from work with them, they really only drain your bank account. They cost you money… they do not earn you money. This is especially true if you take out a loan to buy a car. You are also paying interest on that car loan, which is costing you even more than the list price of the vehicle! And that is a problem. I feel like a car should be an investment… that is, something that earns you money instead of costing you money. Why not make one of the most expensive purchases of your lifetime an asset instead of a liability? 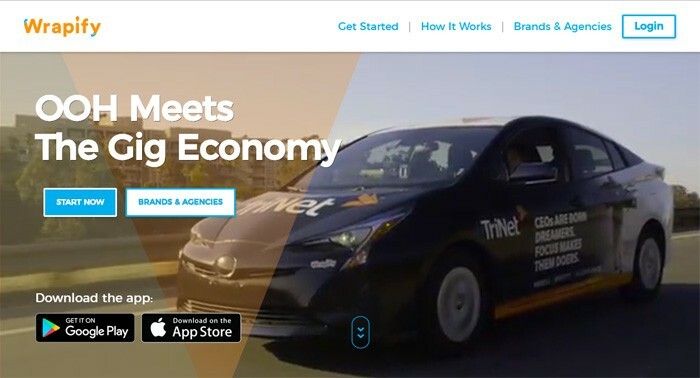 One great company that could let you do that is Uber (or Lyft). But the only problem with these types of options is that these companies both require you to work for the money your car would earn you. For me, the golden opportunity would be something passive. For those of you who don't know, passive income is basically income that you set up and step away from. It earns you money without you having to directly spend your time on it. That led me to thinking… what if you put advertising on your car as a way to earn passive income? If you have a long commute, a lot of people will see your car. Why not sell advertising space on it? This idea led to me doing some Google searches… which eventually led to me finding some websites that do exactly that… sell advertising space on cars! And that is what led me to Wrapify.com. Wrapify is basically a company that you can sign up for either online or with the app. Then, if campaigns in your area become available, you can sign up for them. As long as you qualify for the campaign, you can be chosen and your car will be wrapped with like a plastic-like covering that will have advertisements on it. Then, you drive around with the app on, and earn money while you drive. You can make hundreds of dollars per month, according to the website—and when the campaign is over, the wrapping comes right off, and you are good to go! This is an awesome idea for people who have to drive a lot. If you are going to be driving a lot anyway, doesn’t it make sense to earn money while you do it? Of course, one obvious downside to this is that your car, which you paid good money for, would be covered with advertisements instead of looking like the usual pretty color it came with—but then again, this is a temporary thing. And if it will help to convert your car from a liability to an asset, it shouldn’t be that big of a problem, right? But I also still had a lot of unanswered questions about it at this point. Where can you make use of it? Does it work everywhere, or just in larger cities? I clicked on the ‘Get Started’ button, and found out that the first step was to download the app. So I went to the Google Play store to figure that out. The app was easy to find, and downloading it was no problem. But unfortunately, that was where the problems started. Take a look at this. As you can see, the ratings were pretty stacked toward the bad end. 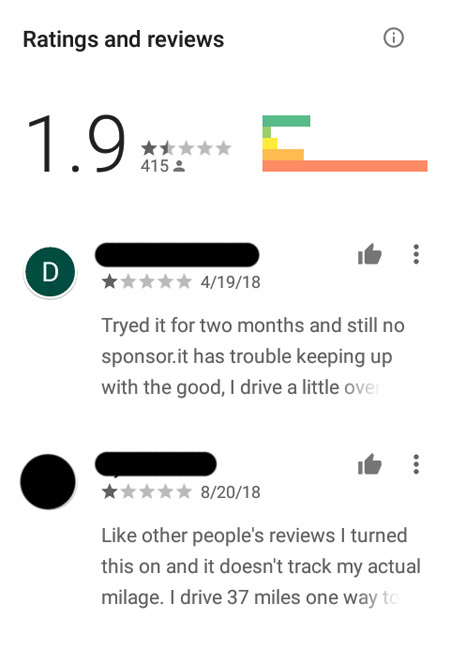 There are also a couple of examples here of reviews that people left, and these reviews actually mirror a lot of the opinions that people have shared about the app. Apparently, there are more than a few problems. From the sound of it, a lot of people don’t like the app… mostly for two main reasons. First of all, a lot of people claim that the app doesn’t track mileage correctly. To understand why this is important, one first needs to understand how this entire process works. 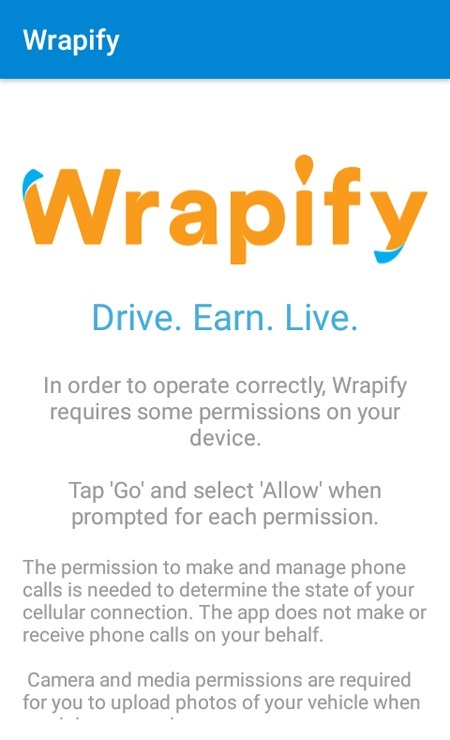 To get started with Wrapify.com, you are supposed to download the app, open it, and drive around with it tracking your mileage. Then, supposedly, based on your mileage, you may eventually get contacted by the company with a campaign offer. That is supposed to be how it works. But according to the reviews on the app, the app doesn’t track mileage very accurately. Some even say that it barely works at all. On top of this, many people say that campaigns are not ever available… which is the second biggest complaint about the app. 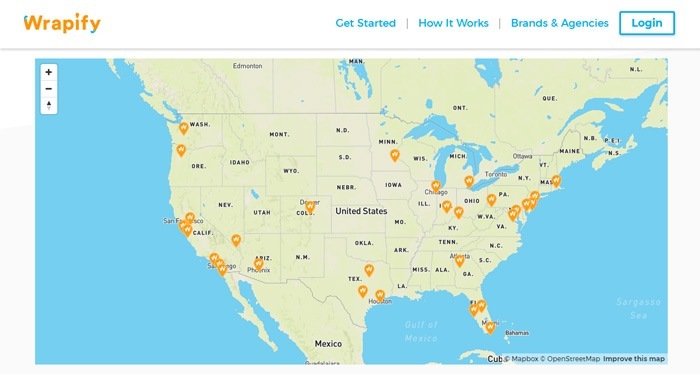 Some people said that they drive a lot of miles in prime areas, but that they never get offered a campaign… making the entire idea a waste of time for the vast majority of users. Personally, I downloaded the app, tried it out, and actually had a different issue altogether. Check this out! This was the first screen I saw when I opened up the app—but it immediately froze here. I couldn’t scroll, I couldn’t push any buttons… I couldn’t do anything. I even tried to back up, but ended up just having to close the app to even get out of it. So yeah. I really had high hopes for this one, but so far it just wasn’t turning out very well. You can also see how there are far more 1 star reviews than 5 star reviews on it in the Google Play store… and that definitely doesn’t bode well. I feel like this idea is a very valid one, but I also feel like it just isn’t being implemented very well in this case. The company has a really nice website. They also do a really good job of branding their service. But I did find this while browsing. It seems to be a map of where their biggest campaigns are focused. As I kind of suspected, my area seemed to be less than ideal for trying to make something like this work. But even so—the app really wasn’t working for me anyway, and I was pretty much to a point where I didn’t feel like it was really worth it to keep trying. Personally, I think that this is a super-good idea, and I really wished that the concept would have worked a bit better for me. I do understand that this type of thing is just going to work better in a high-traffic area, and I do not really live in one of those—so that is something that the company cannot really help. Most of their clients are probably going to be more interested in getting advertisements set up in areas like Los Angeles, New York, etc… places where there are a lot of people condensed into a smaller space. I live in a pretty rural area, not far from a town that is not even that big… so even in the best case scenario, I am probably looking at a situation where I am not going to be able to use this app solely based on where I live. I also feel like the app itself obviously has some issues. With so many negative reviews, it stands to reason that the company could probably do a lot better if they worked on that a little bit. Maybe the Apple app is better than the Android app. But at this point, I was pretty doubtful of that. Maybe in the future this service will be able to realize its full potential. I do, after all, feel like the idea is quite valid. If they fixed the app and found more clients, it seems like it would work a lot better. I would absolutely go for this if it worked in my area. But as it stands now, I don’t think that it’s really going to do me a lot of good. Should you download the app and try to make some money by putting advertisements on your car?